Advanced Virtual Studies (AVS) courses are designed for students to improve critical thinking, reading for meaning, writing across the curriculum, textual analysis, and educational technology skills. These skill sets will allow students to succeed in meeting core high school standards while preparing for the rigors of college. AVS courses require significantly more student-teacher and student-student interaction and time than a general high school course. Each AVS course is divided into modules, each of which focuses on Common Core elements. Students will be expected to then meet additional learning standards specific to the topic. These standards may include researching, integrating research into written assignments, experiential learning, highly engaged team projects, and STEM specific labs. Students will interact with the teacher and other students via Discussion Boards, Skype sessions, Blackboard Collaborate, or other medium deemed appropriate for reaching targeted learning objectives. 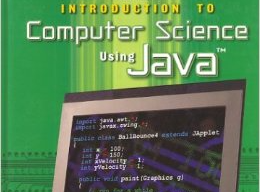 Introduction to Computer Science through Java is an introduction to computer science and programming intended for people with little or no experience. We start with the most basic concepts and are careful to define all terms when they are first used. The book presents each new idea in a logical progression. Larger topics, like recursion and object- oriented programming, are divided into smaller examples and introduced over the course of several chapters. The goal of this course is to teach you to think like a computer scientist. I like the way computer scientists think because they combine some of the best features of Mathematics, Engineering, and Natural Science. Like mathematicians, computer scientists use formal languages to denote ideas (specifically computations). Like engineers, they design things, assembling components into systems and evaluating trade offs among alternatives. Like scientists, they observe the behavior of complex systems, form hypotheses, and test predictions. On one level, you will be learning to program, which is a useful skill by itself. On another level you will use programming as a means to an end. As we go along, that end will become clearer.